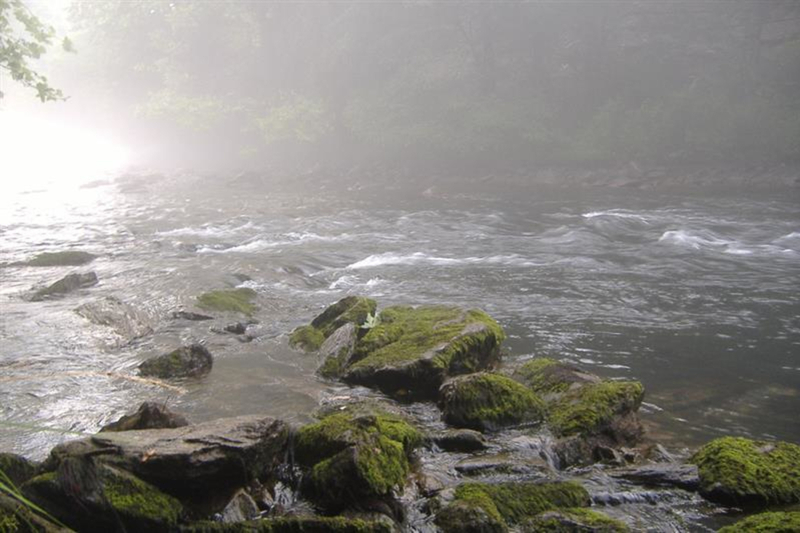 The Nantahala is a river steeped in heritage. 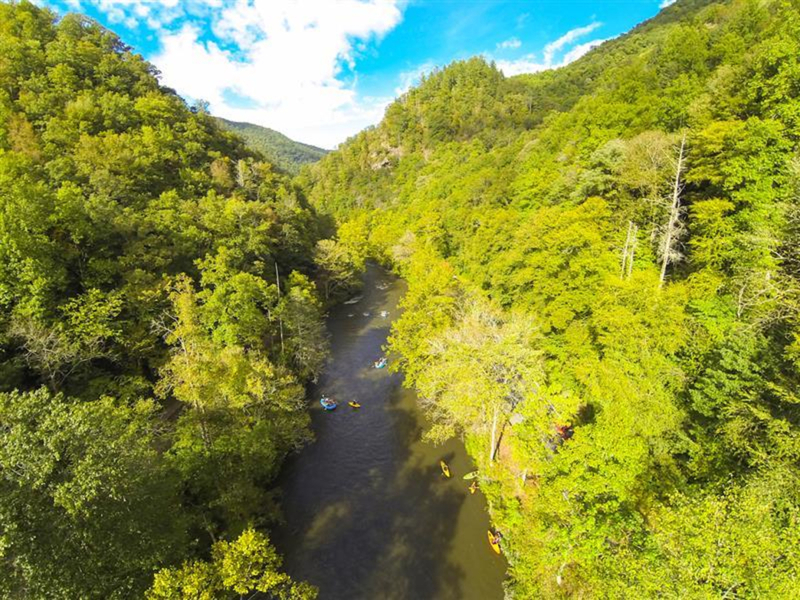 It has been a benchmark intermediate run for over 30 years, and the establishment of Nantahala Outdoor Center was a large catalyst in the development of such a strong outdoor industry in the Southeast. 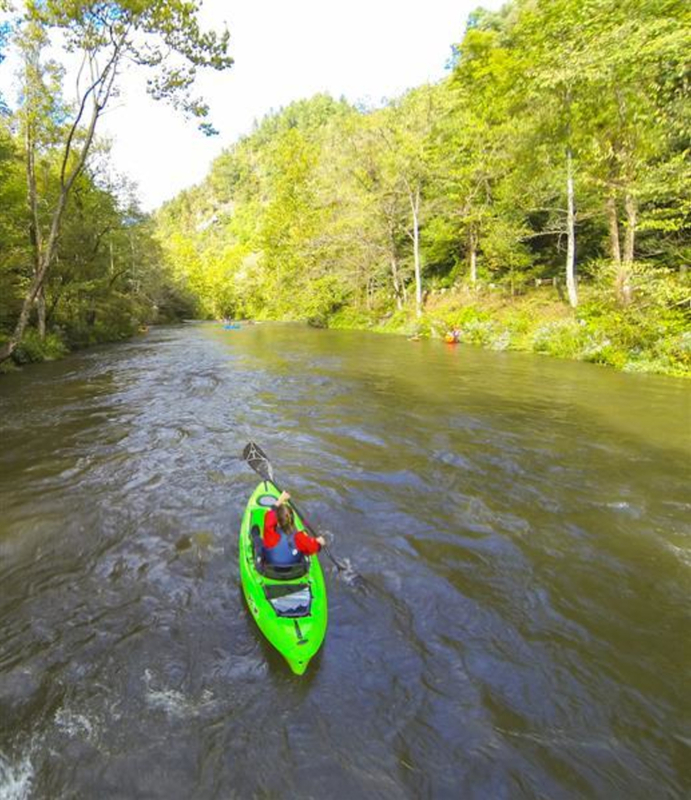 It remains one of the best rivers to learn how to kayak, canoe, or paddleboard in the world. 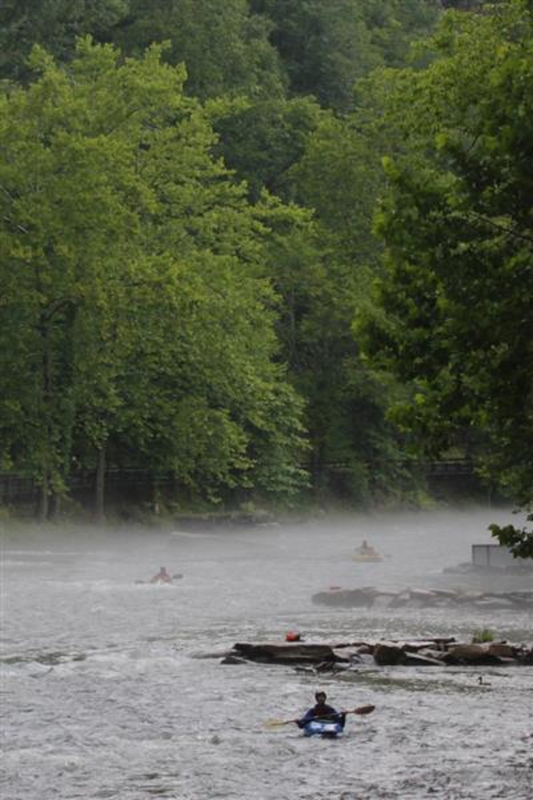 The Nantahala Gorge is ideally set up for intermediate paddlers. It has myriad small surf waves, forgiving eddy lines, and rapids with just enough power to challenge and entertain. 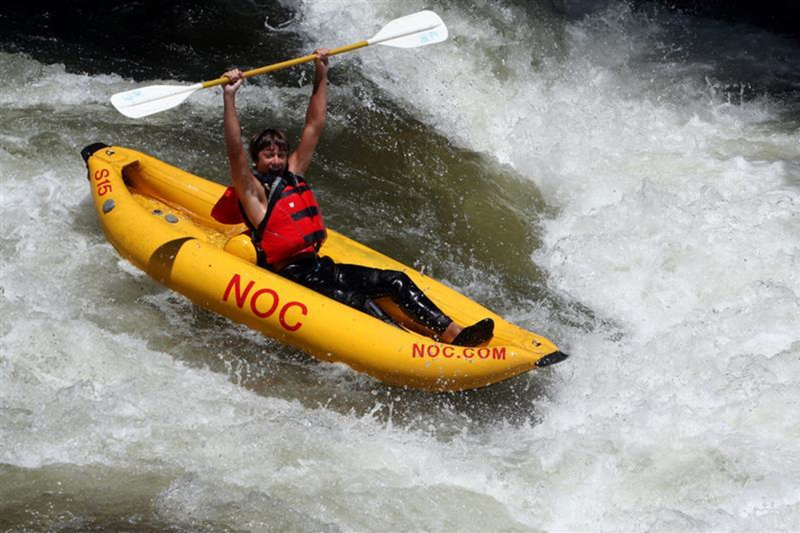 There is also the capability to set up elite slalom courses through Nantahala Falls, and the playhole near NOC has been tweaked through the years, hosting the Freestyle Kayaking World Championships in 2013. 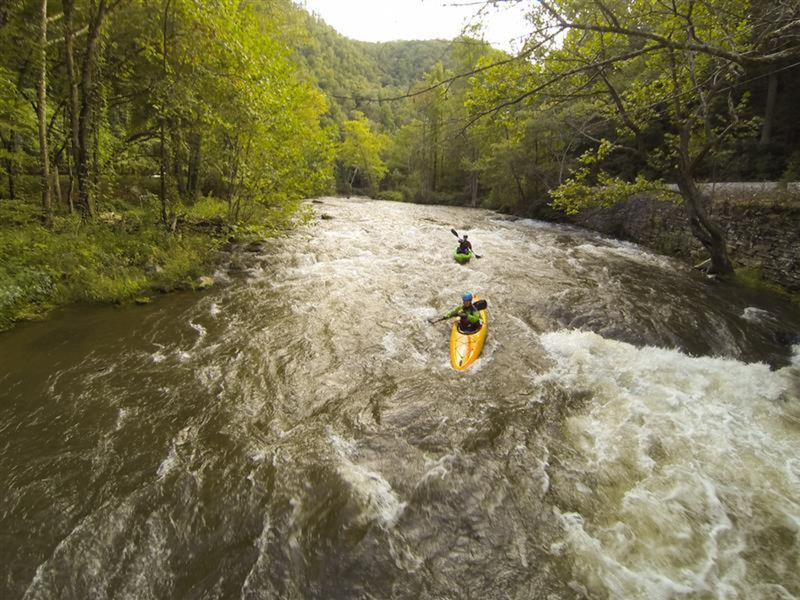 Combine those resources with the class IV-V options upstream, and it’s easy to see why this area continues to be such a strong paddling destination. The Cascades are a very high quality and easily-lapped series of drops. The river channels well, allowing for a wide range of runnable flows (and some big holes at high water). 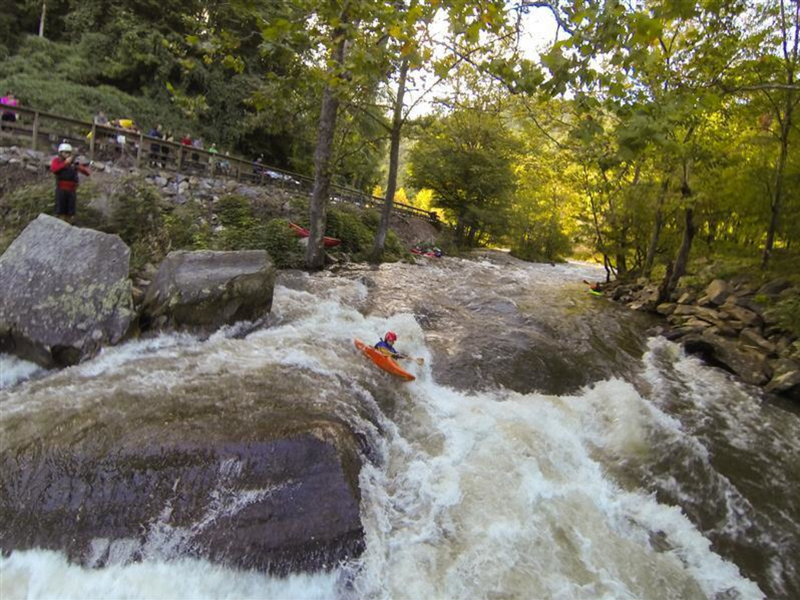 Since this is a dewatered section of the Nantahala, the Cascades run only when Whiteoak Creek is high from a rain event, or during one of a few scheduled releases per year. This is a scenic and busy section of river that provides a great cool down from the Cascades upstream, or a way for aspiring advanced paddlers to get accustomed to more continuous whitewater. The entire section is road-scoutable- watch out for wood. As far as flows go, the same thing applies as the Cascades… there needs to be rain or a scheduled release. 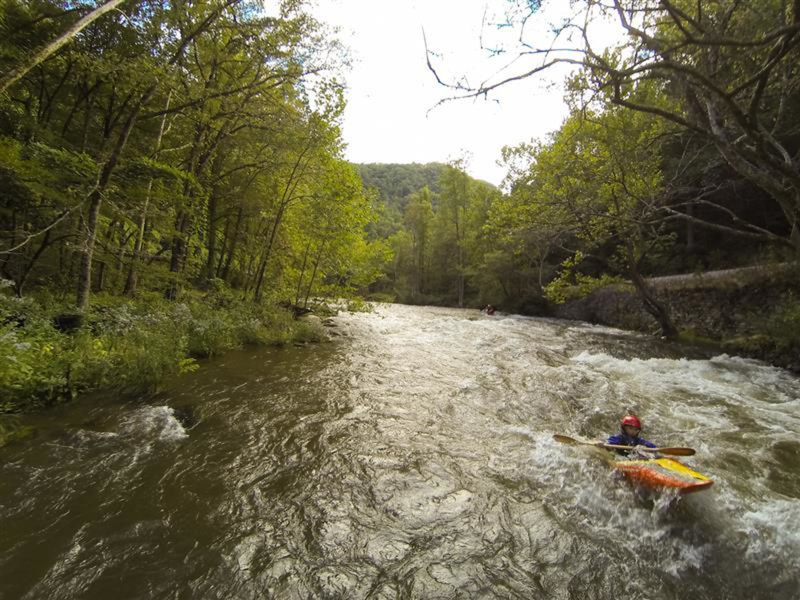 The gorge section is also road-scoutable nearly from top to bottom, and provides a beautiful and stress-free way to get into the world of whitewater. 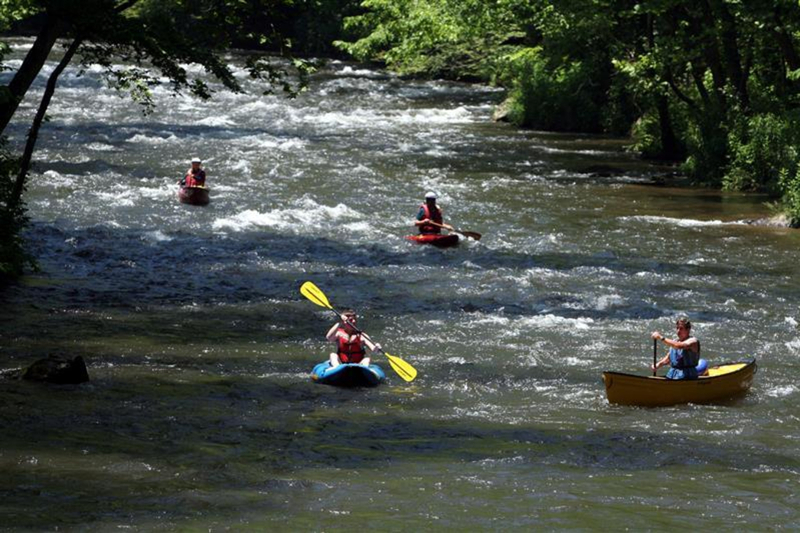 Notable rapids include Patton’s Run (right off the bat), Delebar’s Rock, Whirlpool, Quarry, Surfing Rapid, The Bump, and Nantahala Falls. 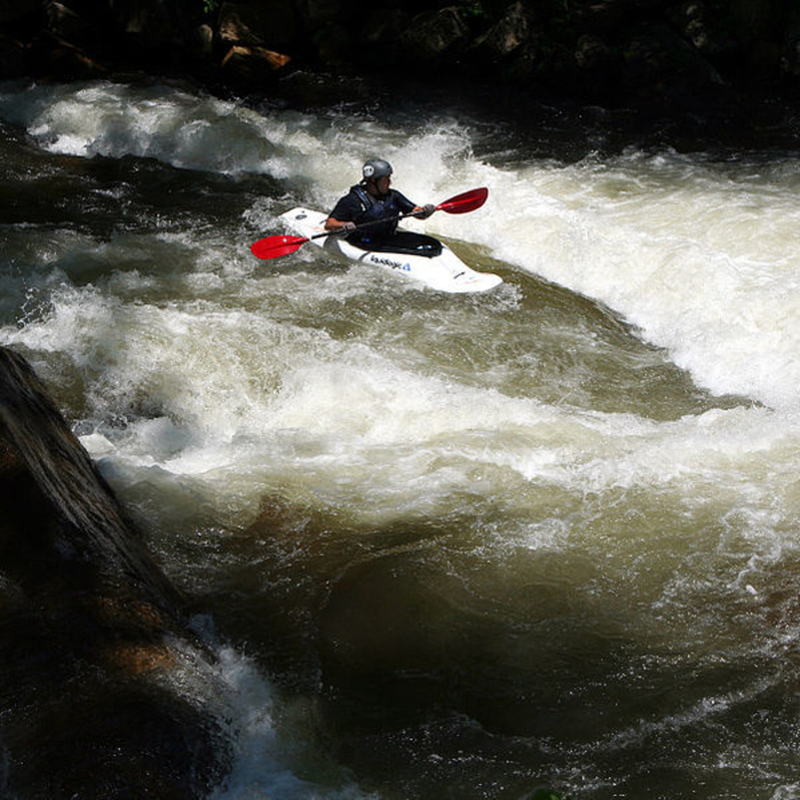 The Falls represents an intimidating class III benchmark for many intermediate paddlers, and the rocks are always lined with photographers and throwbags on a summer day. About 5.5 miles into the run, you’ll see a very obvious large rock on river right (about 10 feet out of the water). 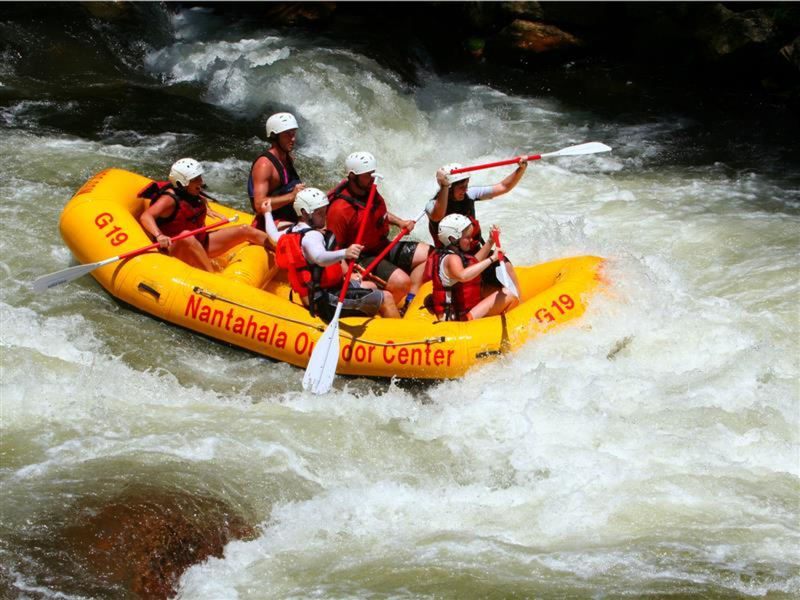 It’s a great pit stop to jump or launch boats off of into the invigorating Nantahala water. 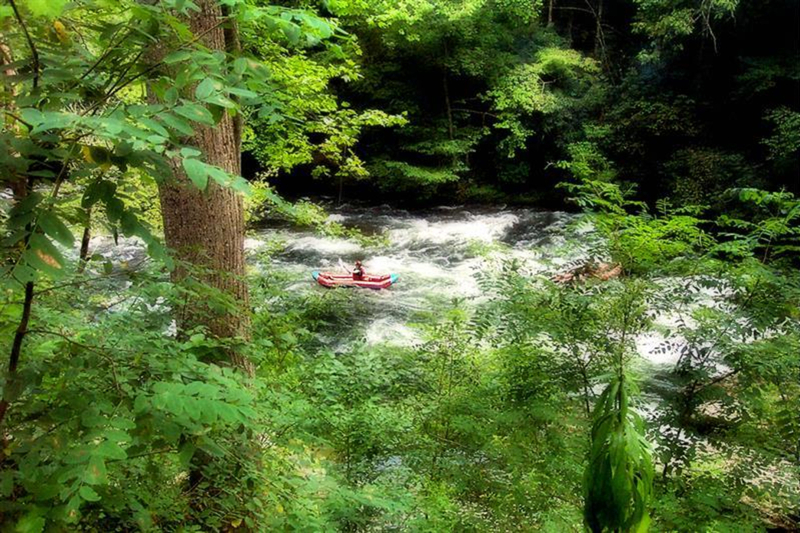 There are several great SUP surf waves on the Nantahala. The two best include one directly below the pedestrian bridge on NOC campus, and another about two miles upstream at Surfer’s Rapid. This restaurant is right next to the takeout, and provides a nice après atmosphere to grab food and reflect on the day. Turn L onto SR 1442/Wayah Rd. Large USFS paved lot on left. Continue on SR 1442/Wayah Rd. upstream for 3.3 miles. Park at the 5th Bridge (if you hit Cascades, you’ve gone too far). Continue on SR 1442/Wayah Rd. upstream for <1 mile. You will see all of the drops; park at the top of the action (if you hit Whiteoak Creek, you’ve gone too far). -It’s necessary to pay the $1 daily or $5 season pass USFS use fee (buy at NOC).